It is now established fact that Liars don't have good memory and that is the case with Mr Shaheen Sehbai, Group Editor, The News International [Jang Group of Newspapers, read him on NRO in 2009 and read the same Shaheen Sehbai's US Based Magazine South Asia Tribune on Pakistani Judiciary particularly read his magazine and contemptuous comment on the present Chief Justice of Pakistan, Mr Justice Iftikhar Muhammad Chaudhry. 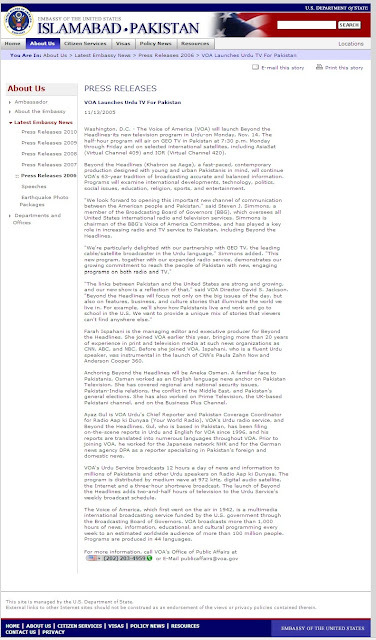 SOUTH ASIA TRIBUNE which he founded in 2002 in USA when he escaped from Pakistan to save himself from the so-called wrath of the establishment headed by General Musharraf, after the controversy surrounding his story about the murder of Daniel Pearl. It was apparently simply to obtain the Green Card for himself, and his family in the United States. 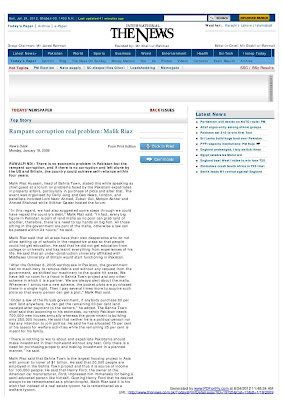 Mr Sehbai then started to run a web based news service, i.e., South Asia Tribune, funded through dubious sources, but he suddenly reappeared and closed his website. During his self-imposed exile in the USA, he used to raise hue and cry against the military establishment that he and his family members’ life was in danger, but the so-called danger suddenly vanished after the whole family getting the Green Cards. 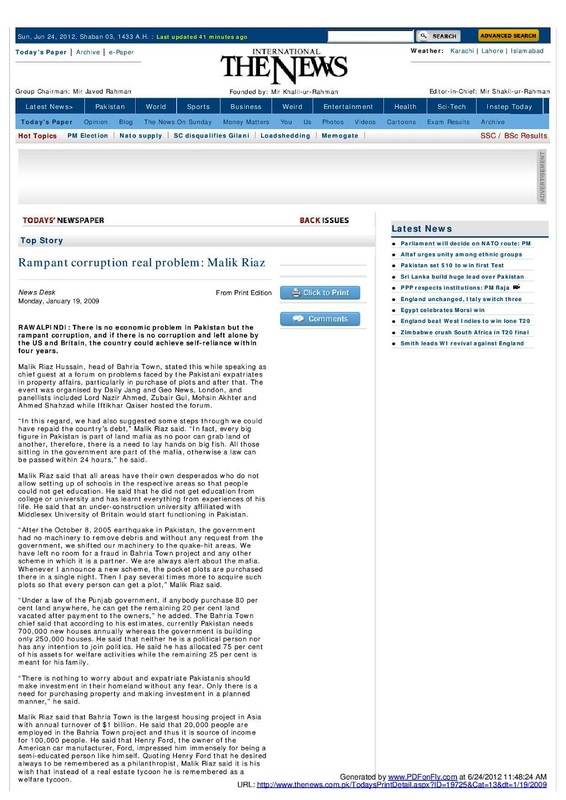 He then returned to Pakistan and that too under the same Musharraf regime, and joined ARY TV channel, then GEO, and then the News, where he is presently working as a Group Editor of The News International, Jang Group of Newspapers. ONE FAR reaching outcome of the whole LFO debate and the passage of the 17th Constitutional Amendment was the obvious lesson for the higher judiciary of Pakistan: Never collaborate with illegal and extra-constitutional forces to subvert the law and the Constitution or you will be humiliated. The lesson was embedded in the insulting episode in which the military ruler, who used the country’s top judges to consolidate and perpetuate his rule, disgracefully dumped these very compliant judges into oblivion, the moment he felt they had become an obstacle to his clinging on to power. The ruler had moved on and found new collaborators in shape of politically ambitious politicians, who, in their eternal folly and unaware of the inbuilt irony, had forgotten that they were the new tools the ruler was now going to use. Even the humiliation being extended to the judges, the original collaborators did not open the eyes of these politicians. What awaits them now is a similar fate: When the ruler is finished with them, they would also be dumped like the judicial condoms. The manner in which the judges of the higher courts were granted a 3-year extension in their service terms was nothing short of open and blatant bribe in return for providing a legal cover to the patently obvious violation of Article 6 of the Constitution on October 12, 1999. The judges accepted it with wide grins on their faces and started acting as loyal courtesans of the Emperor. 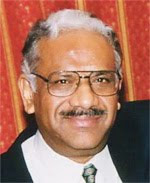 Chief Justice of Pakistan Sheikh Riaz Ahmed, who was to retire on March 8, 2003, was conveniently given a three-year extension, but under the marketable cover of extending the retirement age of all the judges. Justice Munir A Sheikh got the same extension starting July 1, 2003 and Justice Qazi Muhammad Farooq from January 5, 2003. There from these despicable judges started eating out of the hands of the ruler. For four years, every time a political leader or a newspaper editor would question the legality or constitutionality of the LFO, General Musharraf would brush aside the objection asking the questioner to go to the courts if he wanted an answer. The ruler was sure that the judges were his constituency and would not betray him. He had found dependable collaborators who had been adequately compensated and could be offered more if needed. Outside their courts the judicial world had turned hostile against these greedy justices who felt as if they were basking in the deceptive glory of ruling the country as the ‘B’ team of the military. The Pakistan Bar Council decided to boycott the Supreme Court by refusing to challenge any constitutional question before it on the ground that it (PBC) could not expect a fair and impartial decision from the SC. The matter did not end there. The lawyers observed March 8, 2003, the day the Chief Justice of Pakistan should have retired, as a Black Day. 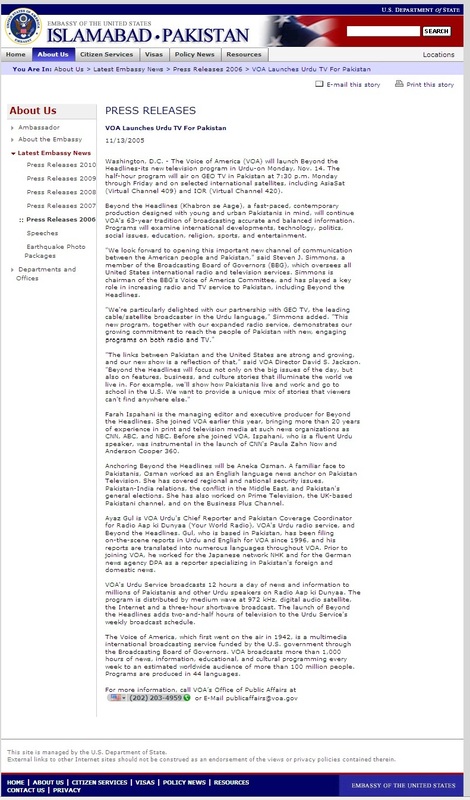 The PBC also held conventions throughout Pakistan against the judiciary. 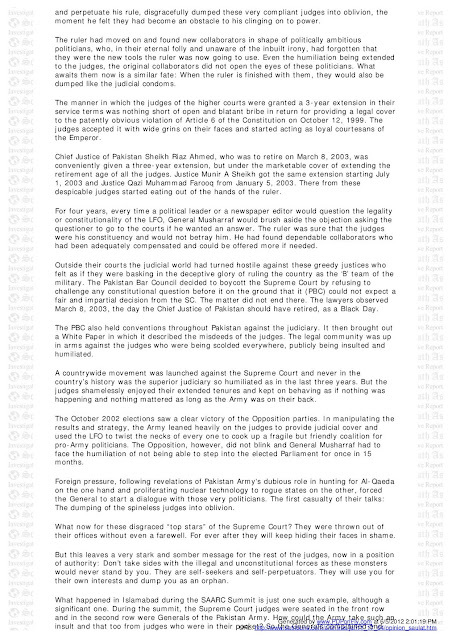 It then brought out a White Paper in which it described the misdeeds of the judges. The legal community was up in arms against the judges who were being scolded everywhere, publicly being insulted and humiliated. A countrywide movement was launched against the Supreme Court and never in the country’s history was the superior judiciary so humiliated as in the last three years. But the judges shamelessly enjoyed their extended tenures and kept on behaving as if nothing was happening and nothing mattered as long as the Army was on their back. The October 2002 elections saw a clear victory of the Opposition parties. In manipulating the results and strategy, the Army leaned heavily on the judges to provide judicial cover and used the LFO to twist the necks of every one to cook up a fragile but friendly coalition for pro-Army politicians. The Opposition, however, did not blink and General Musharraf had to face the humiliation of not being able to step into the elected Parliament for once in 15 months. Foreign pressure, following revelations of Pakistan Army's dubious role in hunting for Al-Qaeda on the one hand and proliferating nuclear technology to rogue states on the other, forced the General to start a dialogue with those very politicians. The first casualty of their talks: The dumping of the spineless judges into oblivion. What now for these disgraced “top stars” of the Supreme Court? They were thrown out of their offices without even a farewell. For ever after they will keep hiding their faces in shame. But this leaves a very stark and somber message for the rest of the judges, now in a position of authority: Don’t take sides with the illegal and unconstitutional forces as these monsters would never stand by you. They are self-seekers and self-perpetuators. They will use you for their own interests and dump you as an orphan. What happened in Islamabad during the SAARC Summit is just one such example, although a significant one. During the summit, the Supreme Court judges were seated in the front row and in the second row were Generals of the Pakistan Army. 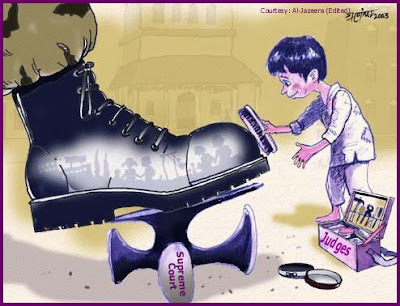 How could the Army take such an insult and that too from judges who were in their pocket? So the Generals complained and the organizers had a tough time accommodating all the judges and the generals in the front rows. 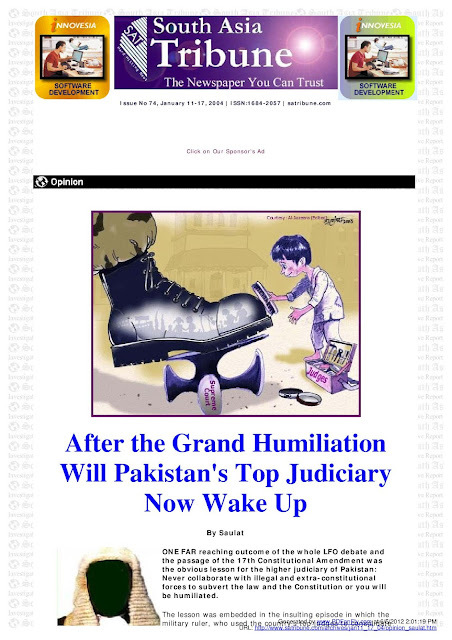 The judiciary in Pakistan must now get out of the slumber and the dream of seeking a share in executive power. It already has immense judicial power and it can make or break governments. The judges should grow up and start making the right decisions, stop succumbing to pressure because they will not gain anything by collaborating with undemocratic and extra-constitutional forces. The first thing a woken-up and rejuvenated judiciary could do is to revisit the issue of LFO, although it may now be of an academic interest only. It should declare that the LFO was never a part of the Constitution and whatever has happened in the Parliament to justify it was unconstitutional. Let the Parliament then revisit the issue and make the corrections needed, not under pressure, but for the sanctity and supremacy of the law and the constitution. Another step the judiciary can take to restore its credibility is to rule that all the appointments made by the Army on civilian posts were illegal and should be canceled. All lands awarded as gifts to Generals should be declared illegal and returned to the State. All jailed or exiled politicians facing the wrath of the military for political reasons must be given relief immediately. Judicial activism for the people and for democracy is now needed. The judiciary has faced a lot of humiliation because of a few black sheep who have also now been sacrificed by their masters. It is time the judges now stood up for the rights of the people. The writer was till recently an important functionary of the military government. He has requested that his last name and last posting not be disclosed. THE JUDICIARY in Pakistan does not have an edifying history. Most jurists agree that its weak-kneed response to the excesses of the executive early in the country’s history have gone a long way in impeding the progress of democracy in Pakistan. When General Pervez Musharraf came to power through a coup in 1999, the Supreme Court of Pakistan again resorted to the Doctrine of Necessity in legitimizing the illegal takeover. In doing so, it became a partner of the military regime and, as the Pakistan Bar Council white paper indicates, it has since enjoyed a quid pro quo, including the controversial three years’ extension in the judges’ retirement age. Indeed, the Pakistan Bar Council decided to boycott the Supreme Court by refusing to challenge any constitutional question before it on the ground that it (PBC) could not expect a fair and impartial decision from the SC. The matter did not end there. The lawyers observed 8 March 2003, the day the Chief Justice of Pakistan, Riaz Ahmed, had to originally retire before the three-year extension as a black day. 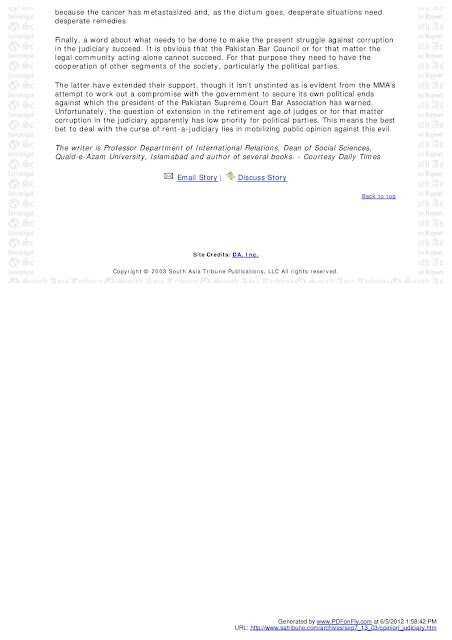 The PBC also held conventions throughout Pakistan against the judiciary. It then brought out a white paper in which it described the deeds of Pakistan’s judiciary. These measures by the legal community are unprecedented in the history of Pakistan. That matters should reach such a pass is unfortunate, but the situation raises a number of questions, which we propose to address here. The judiciary’s saga began in 1954 when the Federal Court upheld the dissolution of the Constituent Assembly by then-Governor-General Ghulam Muhammad. This was followed by the validation by the Court of Ayub Khan’s martial law. Later, it did try to reverse the decision by declaring Yahya Khan a usurper. However, the reversal came about after Yahya Khan’s departure from the political scene. 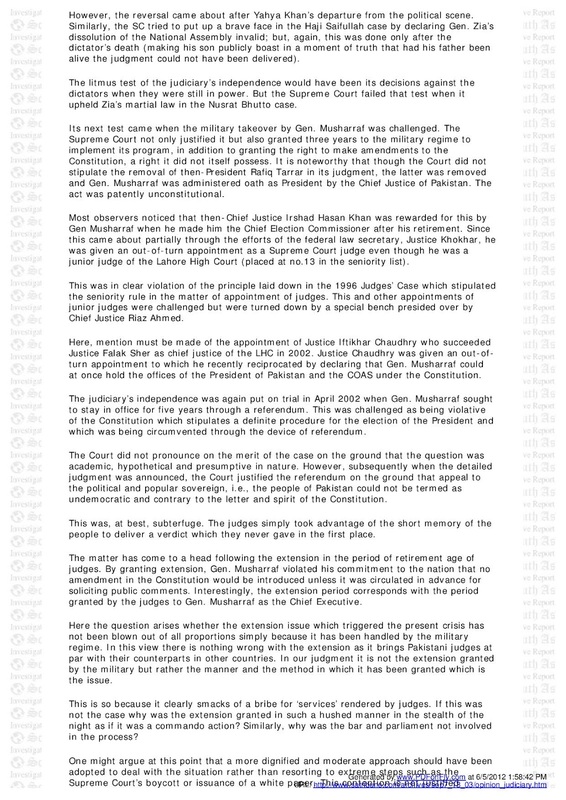 Similarly, the SC tried to put up a brave face in the Haji Saifullah case by declaring Gen. Zia’s dissolution of the National Assembly invalid; but, again, this was done only after the dictator’s death (making his son publicly boast in a moment of truth that had his father been alive the judgment could not have been delivered). The litmus test of the judiciary’s independence would have been its decisions against the dictators when they were still in power. But the Supreme Court failed that test when it upheld Zia’s martial law in the Nusrat Bhutto case. Its next test came when the military takeover by Gen. Musharraf was challenged. 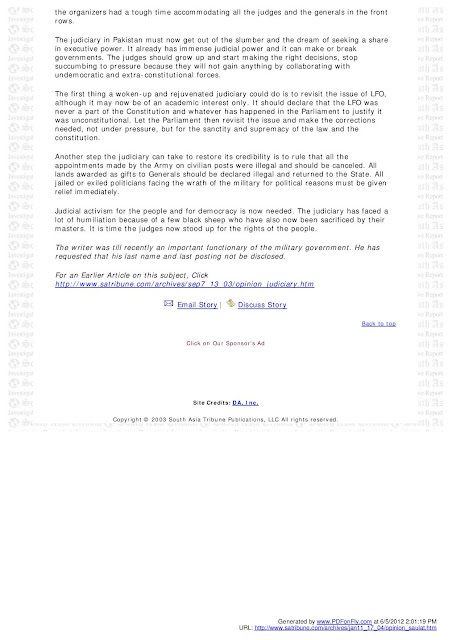 The Supreme Court not only justified it but also granted three years to the military regime to implement its program, in addition to granting the right to make amendments to the Constitution, a right it did not itself possess. It is noteworthy that though the Court did not stipulate the removal of then-President Rafiq Tarrar in its judgment, the latter was removed and Gen. Musharraf was administered oath as President by the Chief Justice of Pakistan. The act was patently unconstitutional. Most observers noticed that then-Chief Justice Irshad Hasan Khan was rewarded for this by Gen Musharraf when he made him the Chief Election Commissioner after his retirement. Since this came about partially through the efforts of the federal law secretary, Justice Khokhar, he was given an out-of-turn appointment as a Supreme Court judge even though he was a junior judge of the Lahore High Court (placed at no.13 in the seniority list). This was in clear violation of the principle laid down in the 1996 Judges’ Case which stipulated the seniority rule in the matter of appointment of judges. This and other appointments of junior judges were challenged but were turned down by a special bench presided over by Chief Justice Riaz Ahmed. Here, mention must be made of the appointment of Justice Iftikhar Chaudhry who succeeded Justice Falak Sher as chief justice of the LHC in 2002. Justice Chaudhry was given an out-of-turn appointment to which he recently reciprocated by declaring that Gen. Musharraf could at once hold the offices of the President of Pakistan and the COAS under the Constitution. The judiciary’s independence was again put on trial in April 2002 when Gen. Musharraf sought to stay in office for five years through a referendum. This was challenged as being violative of the Constitution which stipulates a definite procedure for the election of the President and which was being circumvented through the device of referendum. The Court did not pronounce on the merit of the case on the ground that the question was academic, hypothetical and presumptive in nature. However, subsequently when the detailed judgment was announced, the Court justified the referendum on the ground that appeal to the political and popular sovereign, i.e., the people of Pakistan could not be termed as undemocratic and contrary to the letter and spirit of the Constitution. This was, at best, subterfuge. The judges simply took advantage of the short memory of the people to deliver a verdict which they never gave in the first place. The matter has come to a head following the extension in the period of retirement age of judges. 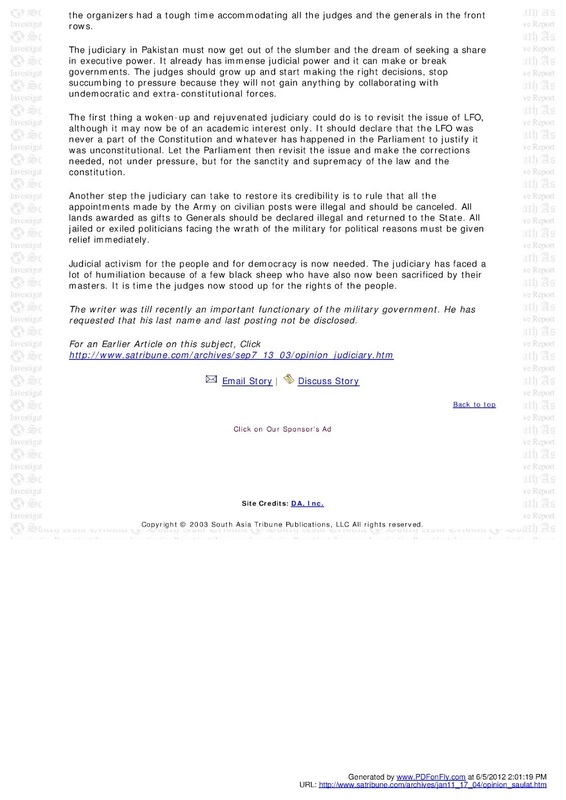 By granting extension, Gen. Musharraf violated his commitment to the nation that no amendment in the Constitution would be introduced unless it was circulated in advance for soliciting public comments. Interestingly, the extension period corresponds with the period granted by the judges to Gen. Musharraf as the Chief Executive. Here the question arises whether the extension issue which triggered the present crisis has not been blown out of all proportions simply because it has been handled by the military regime. In this view there is nothing wrong with the extension as it brings Pakistani judges at par with their counterparts in other countries. In our judgment it is not the extension granted by the military but rather the manner and the method in which it has been granted which is the issue. This is so because it clearly smacks of a bribe for ‘services’ rendered by judges. If this was not the case why was the extension granted in such a hushed manner in the stealth of the night as if it was a commando action? Similarly, why was the bar and parliament not involved in the process? One might argue at this point that a more dignified and moderate approach should have been adopted to deal with the situation rather than resorting to extreme steps such as the Supreme Court’s boycott or issuance of a white paper. This contention is not justified because the cancer has metastasized and, as the dictum goes, desperate situations need desperate remedies. Finally, a word about what needs to be done to make the present struggle against corruption in the judiciary succeed. 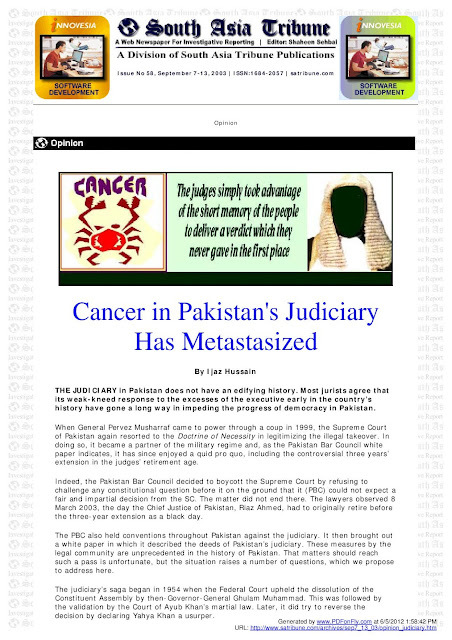 It is obvious that the Pakistan Bar Council or for that matter the legal community acting alone cannot succeed. For that purpose they need to have the cooperation of other segments of the society, particularly the political parties. The latter have extended their support, though it isn’t unstinted as is evident from the MMA’s attempt to work out a compromise with the government to secure its own political ends against which the president of the Pakistan Supreme Court Bar Association has warned. Unfortunately, the question of extension in the retirement age of judges or for that matter corruption in the judiciary apparently has low priority for political parties. This means the best bet to deal with the curse of rent-a-judiciary lies in mobilizing public opinion against this evil.